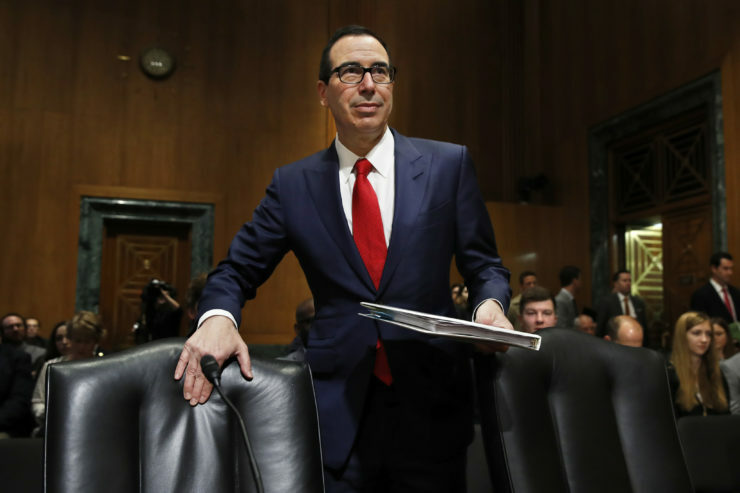 Treasury Secretary Steve Mnuchin previously ran OneWest Bank, which merged with the CIT Group in 2015. The Treasury Department on Monday released its plan to “modernize and improve” the Community Reinvestment Act, a 41-year-old law designed to fight the historic effects of government-sponsored lending discrimination. The move marks the first time the Trump administration has outlined its vision to address lending disparities affecting poor and working-class neighborhoods. The much-anticipated, 35-page report was the result of more than 80 meetings with academics, advocacy groups, banks and trade associations. The Treasury’s recommendations come amid an uptick in scrutiny of the community lending law, following a February report by Reveal from The Center for Investigative Reporting that exposed a troubling pattern of home mortgage denials to people of color in cities across the country. And yet, Reveal also found 99 percent of national banks had received a “satisfactory” or “outstanding” grade on Community Reinvestment Act inspections performed by federal regulators. The report sparked controversy on Capitol Hill, led to investigations from five state attorneys general and a public hearing in Philadelphia, where we centered our investigation. If adopted, here’s what the Treasury Department’s changes would do, and wouldn’t, toward solving four of the major problems we have outlined so far in our ongoing investigation. The Treasury Department’s recommendations would do little to stop this troubling pattern of race-based denial. That’s because the decades-old law is race neutral. David Dworkin, a former Treasury Department official under Presidents Barack Obama and Donald Trump who helped draft the plan, said he supported that decision. “I think if you try to make CRA about everything, it ends up becoming nothing,” he said. Paulina Gonzalez, executive director of the nonprofit California Reinvestment Coalition – which pushed for race to be added as a criteria – said she was not surprised by the Treasury Department’s decision. Gonzalez noted that before he was Treasury secretary, Mnuchin headed OneWest Bank, a large Southern California bank that Reveal reported made three home purchase loans to African Americans and 11 to Latinos between 2011 and 2015. The bank is currently being investigated by the Department of Housing and Urban Development for violating the Fair Housing Act, although it received a “satisfactory” grade in its most recent Community Reinvestment Act assessment. “We’re very concerned about what this means for the future of CRA,” Gonzalez said. Reveal found that banks received Community Reinvestment Act credit for lending to upwardly mobile white borrowers in rapidly gentrifying neighborhoods, in many cases displacing the very residents the law was intended to help. Vedika Ahuja, a senior manager at the nonprofit Greenlining Institute, said she thought the Treasury Department’s proposal to involve economists and other specialized staff in considering “a broad range of economic, demographic, and institution and community-specific information that an examiner reviews” for each bank could help focus government regulators on what communities truly need during their assessments. “That’s really an opportunity to make sure banks are not being rewarded for gentrification mortgages,” she said. While the Community Reinvestment Act requires banks to make loans to qualified borrowers in low- and moderate-income neighborhoods, Reveal found many communities continued to be abandoned by lenders. In Philadelphia, we found that banks were more likely to deny a conventional loan application than grant it in 40 percent of the metro area. People of color were the majority in nearly all of those neighborhoods. This analysis included not only home purchase loans, but also refinance applications and home equity lines of credit. We found home improvement loans were especially hard to get, feeding neighborhood blight. In the overwhelmingly African American Nicetown neighborhood of North Philadelphia, for example, Reveal found banks made 67 home improvement loans between 2012 and 2016 and denied 315. The Treasury Department’s plan proposes an “expansion of the types of loans, investments and services eligible for CRA credit.” Industry groups have pushed for increased flexibility during the scoping process. “We want banks to invest more broadly,” said Dworkin, the former Treasury Department official. He said increasing the types of investments banks could make to meet their Community Reinvestment Act goals would lead to a greater geographic distribution of loans. Right now “you end up with these CRA hot spots where there is enormous competition … with lots of lenders and other places where there are no loans at all,” he said. Ahuja of the Greenlining Institute agreed. “We were surprised at how measured and well-reasoned it was,” she said. Reveal’s analysis of lending in Philadelphia found that banks placed nearly three-quarters of their branches in white-majority neighborhoods. TD Bank, for example, has no branches in majority-black neighborhoods. National studies have also found that bank closures disproportionately affect working-class families and minorities. The recommendations set forth by the Treasury would devalue the importance of branches. “The ongoing adoption of alternative delivery channels will continue to lessen the relevance of physical branches to all communities,” the report states. The Treasury Department says the locations of a bank’s physical branches should be de-emphasized during banks’ CRA review and recommends that banks be judged in a way that recognizes the decreasing reliance on physical branches and the increasing shift to online banking. The American Bankers Association cheered the report. Gonzalez, director of the California Reinvestment Coalition, took a different view, arguing that low-income people and communities of color still depend on branches and that the Treasury Department was proposing lowering scrutiny on branches without coming up with a new system of how to serve these communities. “We’re talking about a situation where there isn’t just a magic wand right now where everyone is going to have equal access to loans,” she said. In March, Reveal reported that America’s biggest bank, JPMorgan Chase & Co., was benefitting from a loophole in the Community Reinvestment Act. The law requires banks to lend to poor and working-class parts of a metro area only if the institution has a branch in the city that takes deposits. We reported that Chase maintained a “trust office” across the street from the White House that arranges loans for wealthy clients, but maintained no deposit-taking branches in the Washington, D.C., metro area. Reveal found Chase made 1,119 conventional home purchase loans in the Washington metro between 2015 and 2016, and only 23 of those loans went to black borrowers, while another 35 went to Latinos. It made only 8 percent of its loans in poor and working-class neighborhoods there. But because of the bank branch loophole its lending in the region was not reviewed by federal regulators. The new recommendations would broaden banks’ assessment area to include not only “areas where the bank is physically located,” but also low-income areas “outside of where the bank has its physical footprint, and in areas where the bank accepts deposits and does substantial business.” The lending patterns in such areas would now be considered under CRA review. Community advocates saw this as a major improvement, but worried that the expansion of assessment areas needed to be coupled with tougher enforcement or the whole effort would be ineffective. Currently, a bank that receives a “needs to improve” rating must secure special approval from federal regulators if it wants to open or close a branch or acquire another business. The Treasury Department’s proposal would make it easier for sanctioned banks to offer more services on the grounds that new branches and products would benefit the community. But Scott Astrada, a lobbyist for the Center for Responsible Lending – a nonprofit advocacy group that participated in the talks that led to the report – said that could provide an incentive for banks to behave badly. “If I’m not doing my job right, but if I can do it in more areas, expanding a job not being well done, doesn’t make it a better job,” Astrada said.